Folks often ask us why we mostly feature French, German and Italian cars on Ran When Parked. While there is admittedly a little serving of personal preference, the truth of the matter is that these are the cars that we come across on a regular basis. We have absolutely no control over what we uncover in junkyards or in barns. With that said, we were incredibly surprised to find a Trabant 601 S in a small and quiet town right off of the Mediterranean Sea. Wearing a faded baby blue paint job, it is a S model that was likely manufactured in the 1980s. 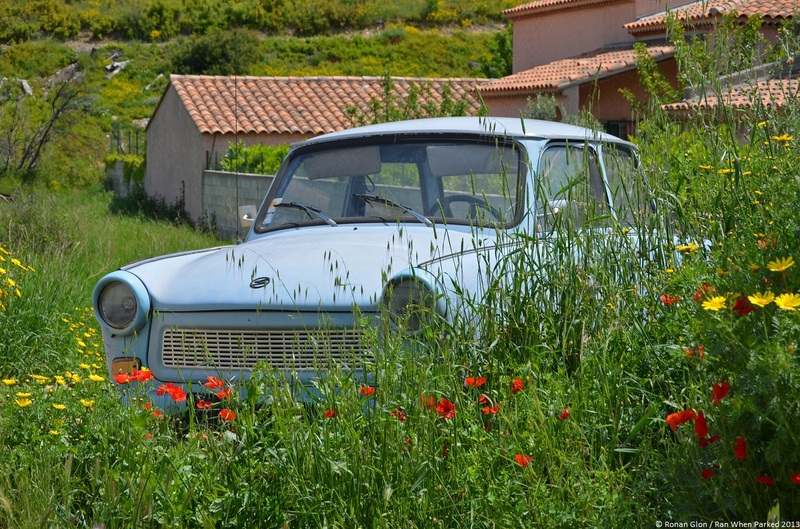 When we first spotted this Trabant, we thought that it had been parked on a vacant lot because of a mechanical issue. However, as we walked around it, we realized that the driver’s side of the car and both tail lamps have started to melt. This is not as far-fetched as it might seem: The entire area caught fire about two years ago when a man tried to claim the insurance money on his Porsche Cayenne by burning it. The flames raged for about a week and got within spitting distance of houses, and most likely the Trabant. Still, it looks salvageable and it holds the honor of being the only Trabant we know of in the area, so we left a note on it and offered to buy it. Stay tuned, with any luck the owner(s) live in the area and will get back to us. It’s cute! Hope you get to rescue it. Also – ” The entire area caught fire about two years ago when a man tried to claim the insurance money on his Porsche Cayenne by burning it.” God, people are idiots!!! yes that would be a great save. but if it does not work out try the one up on ebay right now. I’ve been in Asia on business for the past week and I don’t have my phone on me, so I won’t know whether or not they called me back until Monday morning.